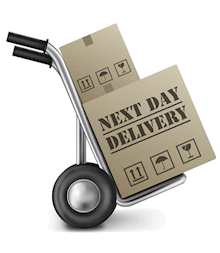 Unlike many of our competitors we won't make you wait 7-14 days for your order! Delivery costs depend on the value and size of your order, starting from only £7.95. The exact cost will be displayed when you add items to the basket and select your area. FREE mainland UK delivery for orders over £200. We cut your foam usually within 1 business day and then send it to you with next day delivery. Orders under 5kg and some large bulky orders can take 2-3 business days. Please contact us if you need an urgent delivery. Your order will be shipped using nationally recognised couriers. The courier will require a signature on delivery. Can I have delivery to a non-cardholder address? Yes, for your convenience you can have your order delivered to an address other than that the one your credit/debit card is registered at, although we may require additional security checks. Please specify at checkout. Can I order goods from outside the UK? Yes, but please contact us first to arrange it. Under Distance Selling Regulations you can return an order within 14 days, only if it's a private non-business order that is not custom made for you (e.g. foam cut to size). For more see our returns policy. How can I return an order/item? Click here for our returns system, all returns have to go through there. If you have any queries regarding your order please contact our sales and support.